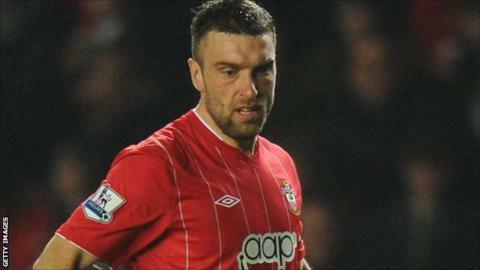 Former Southampton manager Dave Merrington believes Rickie Lambert deserves an international call up after he scored his 100th goal for the club. Lambert, 31, reached a century in 185 appearances with his goal against Newcastle on Sunday, his 12th in the Premier League this season. "His all-round performances are as good as any English striker in the Premier League," Merrington told BBC South. Lambert is the top scoring Englishman in the Premier League this season. He signed for Saints in August 2009 from Bristol Rovers and has played in League One, the Championship and now Premier League for the south-coast club. The former Blackpool trainee's goals helped fire Southampton into English football's top flight and despite being his first season in the Premier League he has not looked out of place. "It is a fantastic achievement [to get 100 goals]," added Merrington who was Saints boss during the 1995-96 season and now works as a summariser on BBC Radio Solent. "The boy has done exceptionally well, he has come up through the divisions. "As a target man he is second to none. He runs the channels well and sees a pass. He can deliver a pass, he works the back post as good as anyone in the country now, including foreign players and his biggest asset is he gets goals. "You give him the service and he will score goals. He is a good player for Southampton. "Now, without doubt he should be on Roy Hodgson's radar. He is as good as any English striker in the Premier League and the England manager needs to have a look at him now."